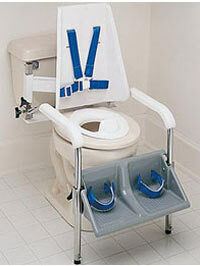 Toileting can be an issue in the bathroom for many parents and care givers. There are several products on the market to make toileting safer for both children and adults and some will work for both. Generally the simpler the product the easier it is to use but the simpler it is the less support it will provide. As with any other equipment, it is important that when the product is purchased, the purchaser knows what the needs are and also have a good idea of what the future needs will be in order to buy the right equipment. A child who is unable to sit unassisted on the toilet because of spasms, seizures, uncontrollable movements, lack of balance or muscle tone etc. is in danger of injury in the event they fall from the toilet. Toilet supports prevent the child from falling off and allow the care giver or parent to attend to the hygiene issues without having to support the child at the same time. When choosing a toileting product, especially pediatric, you should realise the product may make using the toilet awkward for others who do not have a disability. If the child has their own bathroom and no one else uses it, it's not a big deal if the equipment is attached to the toilet and is obstructive for other users. However, if the home has only one bathroom and it is shared by the whole family and visitors one may want to opt for a solution which is not attached to the toilet. The alternative to a support attached to the toilet can be a rehab shower commode or a shower chair depending on the level of support required. Both products have openings in the seat for toileting, both have wheels to move them around, both are designed for toileting and showering and most will have seat frames that tilt. Shower chairs are the simplest and least expensive of these two options but will probably work for most children with disabilities. Rehab shower commodes have many more options including but not limited to large wheels for self-propulsion, head rests, restraint straps, footrests and sizing options. 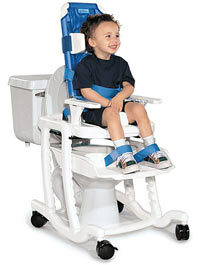 While the shower commodes will likely work for most older kids they are not size adjustable. The Blue Wave Toileting System pictured to the right is probably the apex of pediatric toileting products as it is a four in one product designing exclusively for kids. The Blue wave can be used over the toilet on a wheeled base, on the toilet without the wheeled base, as a free standing commode without the toilet or as a pediatric shower chair. The Blue Wave toilet system is adjustable in height and the seat depth can be increased as the child grows taller.